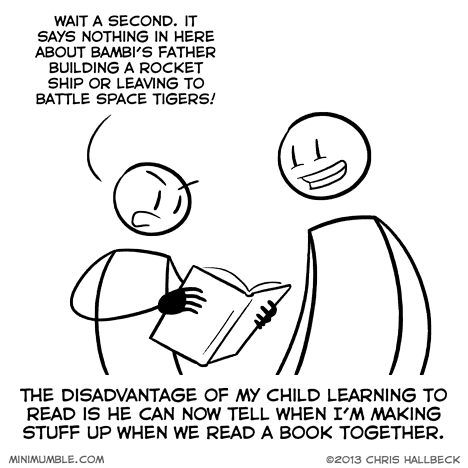 Sounds more like when my nephew would try to read to me when he was little. He’d go off on some really cool imaginative tangents that I wish I could have recorded at the time. kingklash – have you ever heard of Axe Cop? It is a comic of the eponymous Axe Cop drawn by some guy , but scripted entirely by his young nephew. Dark and innocent at the same time. Fun stuff! Imagine how excited I was to see the decent job FOX did for the recent animated version!